Chapter House, Lake Elmo Airport, "B" Entrance, 1000 feet South of the Rotating Beacon. Will talk about his adventures on educating kids. May was a busy month, Chapterwise. Chapter 54 hosted a Chapter Leadership Conference, we had our annual Chapter banquet and there was the annual Chapter Workparty Weekend at Oshkosh. The Leadership Conference, according to Troy Toelle, from Headquarters, was very successful. About 66 people attended including Bob Waldron, Dan Parker and Art Edhlund from our Chapter. Some people came from Chapters as far away as Seattle, Michigan and Iowa. The program lasted all day and was very well presented. The annual Chapter banquet was very well attended. The dinner was good and we all had a good time. The speaker for the evening was Chuck Larsen, Executive Director of Resident Education Programs and of the EAA Air Academy at Oshkosh. Chuck was a former member and former president of Chapter 54. It was a very pleasant experience to visit with Chuck again for quite a few of our older members who are friends of Chuck's. The folks that went to the Workparty Weekend came back with good reports on their experience at Oshkosh. All went well except for a broken rib suffered by Jerry Sarracco. He is recuperating and seems to be getting along quite well. All of these activities could not have happened successfully without a great deal of collective and individual effort. Jim Anderson was volunteered to chair the Chapter Leadership Conference committee and did an outstanding job of seeing to all of the major and minor details involved in the organizing of such an important and complex event. There was housing for the visitors, there were arrangements to be made for meals and breaktimes, tables and chairs to be picked up, delivered and set up, as well as white boards and a P.A. system to be taken care of. When it was all over, everything had to be torn down and returned to its rightful place. A lot of arranging and organizing and a lot of work! Thanks to Jim and all of his committee members. And now to the Banquet. What can I say? Leif Erickson, THANKS! What a good job! Leif is the Director of Events in our Chapter and he accepted the responsibility and did an outstanding job of coordinating all of the major and minor details necessary in organizing a banquet. Arranging for a restaurant, selecting the menu, soliciting the door prizes, collecting the money, organizing the program and finding a speaker. This a long and time consuming job that was well done. Great dinner! Great program! Great time and really great door prizes Thanks Leif and committee! I don't have a lot of information on the Workparty Weekend, but I have attended several in the past and know what a good time they can be. Maybe while Jerry is convalescing he will have time to write a report to be published in a future newsletter. I think we have a number of members that are unaware of the rewards and insights that are available through one of these Workparty trips. On Wednesday, June 7th, there will be a board meeting at the Chapter House. The meeting will take place at 7:00 P.M. The agenda will deal with the upcoming Fly-in Pancake Breakfast. On Tuesday, May 30th, a meeting was held at the Chapter House. Arrangements for the breakfast were discussed. Leif is already doing a great job organizing things and he is going to need a lot of people to help him. This year we have a wonderful opportunity to make this the best program we have ever had. With our very own brand new grille and a tremendous effort by all involved, we can really have the most successful event in the history of our Chapter. With a little help form God, regarding the weather, there is nothing to hold us back except the lack of effort. The other thing on the agenda is an idea I have for a fund raiser. At the Leadership Conference, someone from one of the Chapters in attendance mentioned a raffle that was very successful. They built and raffled off some pedal planes. I have already talked to Ed and he said he has a set of plans and some ideas. We can discuss it further at the board meeting. Again, let me express my gratitude to everyone involved in the organizing and setting up and tearing down of all of our May activities. I don't know all of the names and can't remember all of the details, nevertheless, let me say THANK YOU! It takes a lot of effort and volunteerism for any Chapter to be successful and there is very little recognition for all the effort. Dave Fiebiger reports that the Tax Bill passed, which means that hangars will now be taxed at the 1.65 rate instead of the 2.4 rate, also our hangars are now considered non-commercial. No meeting was held at the Banquet, but a good time was had by all. On May 5th, Dan Parker and Art Edhlund and Bob Waldron and more than fifty members of EAA Chapters from Minnesota, Iowa, North Dakota, Wisconsin, Michigan, and Washington, attended an all day conference at Valter’s Aviation. The intent of this event, was to help make Chapters stronger, more active, and better. The meeting was led by EAA’s Troy Toelle and Brenda Anderson (both of Headquarters' Chapter Group). A Chapter President from a Chapter in Michigan presented a lot of the program. Time was spent showing how to find out what the Chapter should be doing, how to get people to do it, and how to raise money to get it done. Headquarters is concerned that many Chapters are faltering, are not keeping good records, have dwindling memberships, and are not going to be able to survive. Some time was spent polling the various Chapters represented, for good ideas. Some Chapters own their own building, some have raffles for thousands of dollars of prizes, most have pancake breakfasts, some have food booths at other air-shows (similar to Anoka Aviation Days). Headquarters is concerned about the increasing average age of Chapter members, there is no young blood. They are also concerned that there is less ’Family’ involvement than there was in the early days when Paul and Audrey started the EAA. When asked for suggestions to change things, one participant suggested that the EAA ask members if they would like to have their spouses name on the mailing labels (similar to some other aviation organizations), and Troy felt that that was a great idea, and took it back to Headquarters. Troy also suggested that Chapters start doing it right away. Troy wanted to know how many Chapters have swing sets, VCRs with kid’s videos, picnic tables, and other things that might be ‘family’ oriented. The conference was well received. The facility was good, except that Troy left the big hangar door open, and we had to stop occasionally for people ‘running up’ at the end of runway 22. Troy felt that this conferences was the best one that they have had (outside of Oshkosh), and was very pleased. The preparation of the hangar, setting up of the tables, getting rolls, getting the box lunches, and clean up, was handled by Jim Anderson and a number of Chapter 54 members. April 29, 2000 dawned CAVU, perfect for initiation of nine new ' Eagles.' They gathered at the Chapter house to find out what we're all about, and to try flying. Our new friends ranged in age from 17 to 59. The youngest also qualified as a 'Young Eagle.' Thanks to Chapter volunteer pilots Gene Frank, Paul Liedl, and Art Edhlund, all enjoyed their introductory flight. Eight of them joined EAA on the spot. (Laura Huizenga's husband Kirk is already a chapter 54 member.) All were prepared to attend our May chapter meeting except the Annual Banquet replaced the regular meeting. They will join us at the June meeting however. Please make them welcome, all are seriously interested in some facet of general aviation. Their names are: Nicholas Shanklin, Oakdale; David Mellgren, White Bear Lake; Kevin Buck, St.Mary's Point; Rick Bise, Woodbury; Tony Weber, White Bear Lake; Fernando Castro, St. Paul; Gale Havrilla, Oakdale; Jerome Ternowski, Maplewood. The new format for Flying Start really worked. But that's not the end of the story, Troy Toelle from EAA Chapters, informs me they are preparing an assortment of formats for next year! Thanks to the volunteers, and a hardy welcome to our new EAA ers. A great time was had by more than two dozen people at the Potluck supper on Friday Night. It was too blustery to do any flying, but President Bill brought some of his famous potatoes and everybody else brought some GREAT food, and there was plenty of hangar flying to make up for the unpleasant weather. If you missed this one, you will get another chance the Friday night after the next meeting. Rae Kupferschmidt really knows how to throw a great PotLuck supper. What's The Value of One Member? One disliked the President, then there were nine. One forgot his promise, then there were eight. One lost enthusiasm, then there were seven. They quarreled over programs, then there were six. 'Til one complained of meetings, then there were three. Three eager Members! What do they do? One got discouraged, then there were two. One jointed the Elks, then there was one. Met with a neighbor, then there was two. Doubling their number, then there was four. 'Til each won another, then there was eight. In another six verses, there'll be a thousand twenty-four! Leif E. distributed folders to each committee chairperson present. The folders contain a master task list for each committee. Chairpersons were asked to record each task they perform that is not on the task list. The goal will be to develop an accurate master task list for each committee. Also chairpersons were asked to record dates, deadlines, contacts, and phone numbers. These folders can then be passed on to new committee chairs in following years. Leif will continue to recruit committee chairpersons. 3. Price - $5.00 per adult; $2.00 for children 12 and under; free breakfasts for PIC, Fire Dept and National Guard members that exhibit. 4. Liability insurance is available from EAA free of charge. Leif E. will contact Bob Mackey (spelling?) at EAA headquarters. 5. Ford Tri-Motor/DC3 – Due to expenses involved and lack of hanger space it was decided we would not pursue an appearance by the Ford. In the future, it was suggested that we contact the local Ford motor dealers in the area for possible promotions. Gary Miller suggested that next year we get an earlier start on advertising. The Chapter will donate $50 to the Lions Club for use of their tables and chairs. Gary Miller suggested that we contact the parachute-jumping club from Baldwin, WI about doing a jump during the morning. Gary will contact the MAC for permission, as it may be necessary to temporarily close the airport during the jump. Also a NOTAM may be required. Gary also suggested contacting a hot-air balloon company about a static display and the possibility of a launch at the close the event. Gary will check with the MAC about permission for the lift-off. Gary further suggested a glider landing. That would require a tow airplane be available to launch the glider for its return trip back to its home airport. Gary will again investigate and make arrangements with the MAC. Gary Miller has posters and flyers printed for the event. 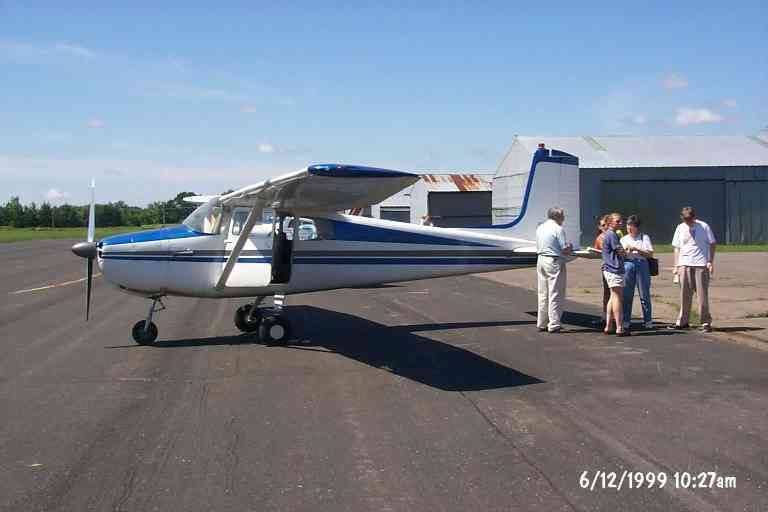 Gary suggested that any chapter members flying to other fly-in breakfasts this summer bring and distribute our flyers. Bill Shanks will contact the Jim Gannon from the Valley Cruisers about displaying their street rods. Gary Miller will contact Princeton Flight Service about having our event included in their broadcast information. Jerry Sarracco and Bill Shanks will investigate obtaining the services of an air traffic controller for the morning. This may be necessary if we have a large volume of airplane traffic as well as parachute jumpers and a balloon launch. Bob Donatelle will be contacted about a display from the radio control organization. An aviation art vendor has contacted Leif Erickson about parking a trailer and selling aviation art prints and paraphernalia at the breakfast. The committee agreed to that provided a donation (no amount specified) is made to the Chapter. Leif will contact the vendor. Jerry Sarracco will establish aircraft parking areas and safety procedures to be followed. It was pointed out that Anoka has a very good plan for no propeller zones and aircraft parking during their Aviation Days. The general public is separated from private aircraft parking areas. Jerry will also arrange security for static aircraft displays. For anyone requesting aircraft parking on blacktop instead of grass, Ed Mayer’s old FBO location was suggested. However that would mean we would have to provide ground transportation to and from there to Valters Aviation. It was suggested that we encourage all incoming aircraft to park on the grass in the designated parking areas. Jerry Sarracco will also contact the MAC about cutting the grass prior to the event. This should make aircraft parking easier. Bill Shanks will contact the war birds and the Confederate Air Force about setting up a static display and/or flyby. Leif E will schedule the next meeting in June following the regular Chapter meeting. Adults $5, Kids (under 12) $2, Bring lots of hungry people! Bring your families, relatives, friends, neighbors, and anyone else you can think of! Our most critical need is for 1st and 2nd shift cooking/serving, setup, and teardown help. Member Mark Holliday bought a Midget Mustang which was completed in the 70’s but was not flown. Mark says that the workmanship is good. Mark wants the engine, and is willing to sell the complete airplane for $6,500.00 without the engine. Mark likes the engine, cuz it is an o-200 with a fuel pump, and has a vacuum pump. Mark could also sell that engine. Contact Mark at MarkH85@AOL.com, or at (651)770-3881. If you don’t know what a Midget Mustang looks like, check with Al Amsden or Dennis Hoffman at 21D. We still occupy the Chapter Building. Ed Mayer is in favor of allowing us to stay, until he sells the building.